Just hanging around for fun! Slightly smaller than ''Life-size'', but no longer living, Rotten pale blood-drained cut-off victim's head has straggly poly/nylon hair, and an awful grimaced expression that you won't forget. A favorite among our Body Parts Section, Hector the White Faced Severed Head is made of dense poly-foam and nylon. 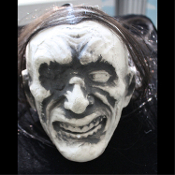 Hector is a cheap Halloween prop and a great addition to your Horror Decor. Head Size 7-inches (17.5cm) High x 6-1/2-inches (16.25cm) wide. ...ready for that voo-doo, that you do, so well! Made of dense foam with dangling scraggly hair. 7-inch (17.5cm) tall x 6-1/2-inch (16.25cm) wide. Hanging Halloween Haunt Prop Decoration Detailed Disembodied BODY PART.